The Gowanus Lounge: Introducing the Gowanus Hotel District? Introducing the Gowanus Hotel District? Is Gowanus becoming Brooklyn's other hotel district, after downtown? It just might be. Our friend Gabby Warshawer at Brownstoner scored a huge scoop with news that not one, but two, hotels are being planned for President Street between Third and Fourth Avenues. 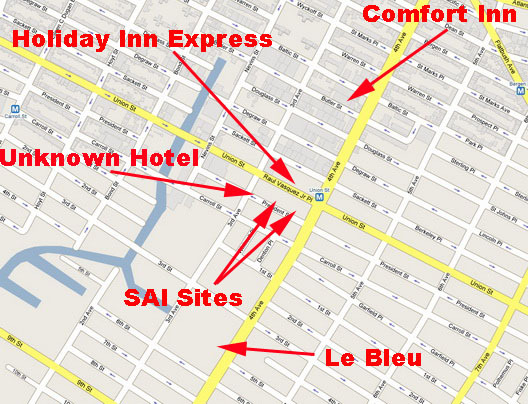 SAI Hospitality, which specializes in budget lodging is building a 105-room hotel at 529 President Street and a 120-room hotel at 551 President Street. Counting another hotel planned at Third & President, it would be the third hotel within a block, and make President Street South Brooklyn's Hotel (Motel?) Row. SAI told Brownstoner they're going to try to lure an operator "like Hilton." A Gowanus Hilton? Eh, they'll probably call it the Park Slope Hilton. Regardless, if all the projects end up being built, there will be six hotels in the Greater Gowanus Hotel District. Oh, good. That way when the hurricane storm surge floods everything up to 4th Avenue, fewer permanent residents will be displaced.